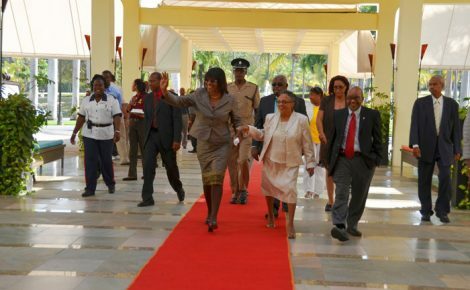 Prime Minister the Most Hon. 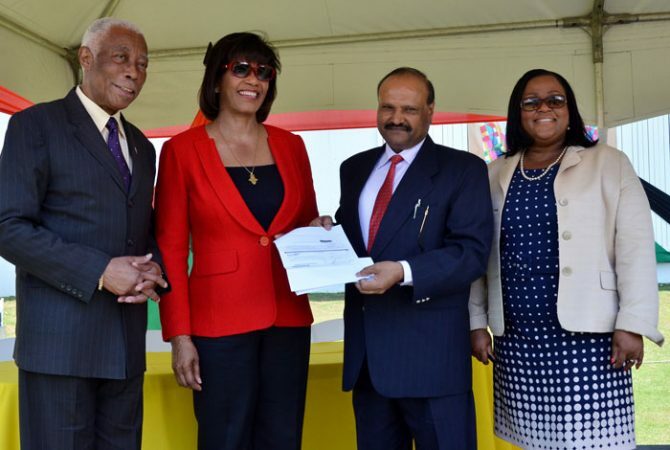 Portia Simpson Miller (second left), and Indian High Commissioner to Jamaica, His Excellency Shri Pratap Singh (second right), hold the signed Memorandum of Understanding (MOU), that will see the Indian Government providing US$2.1 million for the installation of flood lights at Sabina Park. The signing took place at Sabina Park on April 1. Minister with responsibility for Sport, Hon. 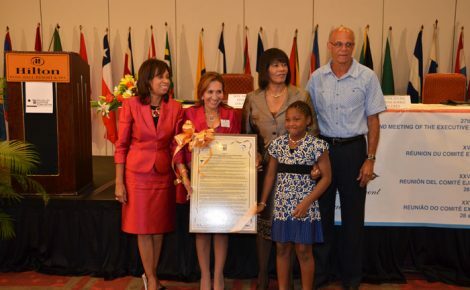 Natalie Neita Headley (right), and Minister of Foreign Affairs and Foreign Trade, Senator the Hon. A.J. Nicholson, witnessed the signing. By July, Jamaica’s cricketing Mecca, Sabina Park, will be able to host night matches, as a result of a grant being provided by the Government of India, to install floodlights at the venue. The Fosrich Group of Companies has been awarded the contract to install the lights, with the Urban Development Corporation (UDC), managing the project. Addressing the media launch of the Sabina Lighting Project, Mrs. Simpson Miller thanked the Indian government for the financial assistance. By July, Jamaica’s cricketing Mecca, Sabina Park, will be able to host night matches, as a result of a US$2.1 million ($229 million) grant being provided by the Government of India, to install floodlights at the venue. The funding is being made available under a Memorandum of Understanding (MoU), which was on April 1 signed at Sabina Park, by Prime Minister, the Most Hon. 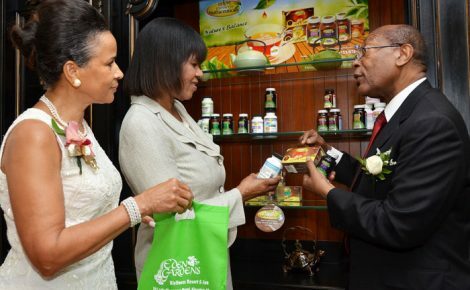 Portia Simpson Miller, and High Commissioner of India to Jamaica, His Excellency Shri Pratap Singh. She informed that the Tourism Enhancement Fund (TEF) will provide an additional grant to cover the shortfall between the contract cost of the project, and the grant from India. The Prime Minister recalled Sabina Park’s proud tradition as an important sporting venue in Jamaica. She said upgrading of Jamaica’s sport infrastructure is an important factor in national development, and noted the power of sport as a unifying force. “With lights at Sabina Park, we can host major sporting events which are beyond our reach at this time,” Mrs. Simpson Miller said. In the meantime, High Commissioner Singh said the first installment of US$770,000 ($84 million) is being released immediately, and the balance at a later date. “I am confident that this gesture, on the part of Government of India, should pave the way for further enhancement of the relationship between our two countries,” the High Commissioner said. He also noted that the assistance is a reflection of mutual trust and understanding between both countries, and also the recognition of Jamaica as one of the most outstanding aficionados of the sport of Cricket. “In the end, I wish all Jamaican authorities associated with Sabina Park Holding the very best for a successful completion of the installation of flood lights in the stadium and hope that this gesture, on the part of Government of India, would help them achieve their goal to enable them to host all future cricket events in a befitting manner,” the Indian High Commissioner said. President of Jamaica Cricket Association, William ‘Billy’ Heaven, said the lights should be ready for the start of the Caribbean Premier League.